Home » lifestyle » Let’s Talk!!! Asides From Money, What Else Do You Really Want Right Now? Let’s Talk!!! Asides From Money, What Else Do You Really Want Right Now? It’s never stated in any scripture that Man wants are satiable, even the popular economics subject state it outrightly that Homo-economicus wants are insatiable. But amidst other good things of life have we ever thought of what other feels we really want aside Money? I guess No! na that money be our main problem for this Country. Well, am giving you the free will as you never know if am your God sent 😂, to tell me aside money, what else do you really want? if there is any at all, let me have it in the comment section. Before you air your Wants in the comment section, let me give you an insight on some other things I personally want aside money, and that is PEACE OF MIND. 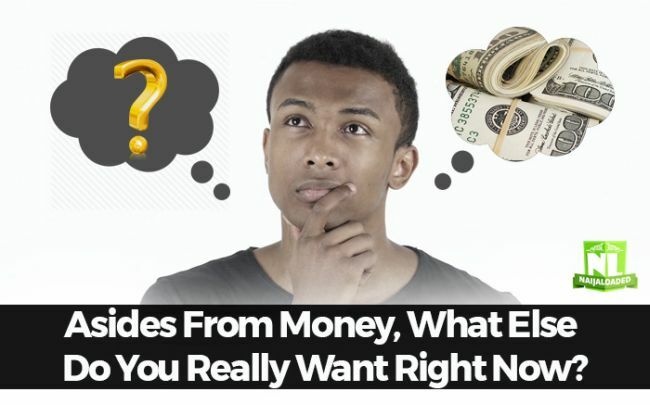 Asides From Money, What Else Do You Really Want Right Now?